I FLEW BACK from Bangalore’s new BIAL airport yesterday – but set off at Indiranagar at 1AM to catch a 6:45 fright. While by day, Bangalore’s roads are a living nightmare, at 1AM in the morning they’re clear and I reached the airport in one hour and 15 minutes. Despite reports in the local press, the road to BIAL is pretty good, and the airport is a vast improvement on HAL. Not everything is quite finished. The shops are half empty – the boys told me that the alcohol for the duty free area had yet to clear customs. Books don’t need to clear customs – the bookshop had hardly anything in it. There’s a shortage of tags for hand baggage, so a queue formed of people who had almost got through security to be sent back and wait for the authorities to, presumably, print some more. You can’t get through emigration without having a script called the user development fee which costs Rs 1,070 – you’re exempt if you’re under two years old. This has been “approved by the Ministry of Civil Aviation of India”. And a leaflet says: “If you are paying by cash you are requested to provide exact change.” The taxi fare to the airport was over Rs 1,000 – to the old HAL airport it would have been about Rs 200. This entry was posted in Uncategorized and tagged Bangalore, Bengalaru, BIAL, HAL, Subway. Bookmark the permalink. Thanks for your post, which I found useful. Cd not agree with you more about Bangalore cities and how different they are after midnight…must have been a breeze to go from Indra Nagar to Devenhalli. Yes, we know it is way out of the city, but it was good to read that the airport ain’t all that bad. 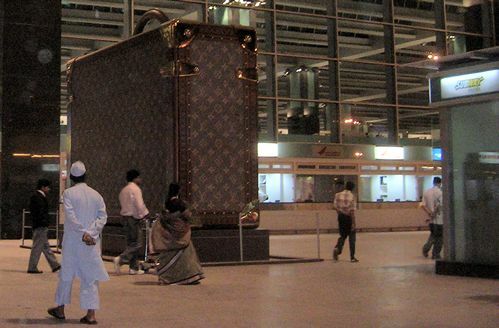 I love that picture of the designer sculpter…wonder if LV paid for that piece? Did you take a cab from one of the BIAL operators (Meru or Easy cabs?) Or was it a cab from the neighborhood? Very informative piece. I guess the hype about the distance is largely a non issue! glad to hear we can finally be proud of Bangalore’s new airport. thanks for the info madmikemagee. Do we need to pay the user development fee when you depart from the airport (or) it is already added to the ticket? What about arrival? You pay at a counter near security/immigration. A leaflet tells me that from July the fee will be included in the ticket. Same leaflet suggests it’s for outbound folk only. Very informative. Will have to remember to pack change. Thank you for your interest in Bengaluru International Airport. Your comments and feedback are appreciated. If you have any queries on the airport do feel free to get in touch with us. Hi I understand from one of my friends who is a pilot that there is no ILS or instrument landing syatem at BIAL whereas this was availaible at HAL.This makes landing at night very difficult and when there is fog it is even more difficult.Where is the lag please clarify and resolve this. I suspect AAI is the culprit or is it BIAL.Irrespective of the fault this needs to be sorted out right now as peoples safety is at stake. The BIAL airport is good not great,needs a bit of a finetune and is a blessing when compared to the hell called HAL. We need only BIAL as the sole operator,we dont need HAL airport.I wonder where the supporters of HAL like Mr RK Mishra and Mrs Kiran Shaw were since 2004 wen the agreement was signed,they have woken up from their sleep only in the past 1 year.The politicians like Mr Katta naidu need to get their act together and get the infrastructure in place instead of crying wolf now.Do your job instead of spoiling somebody elses work.